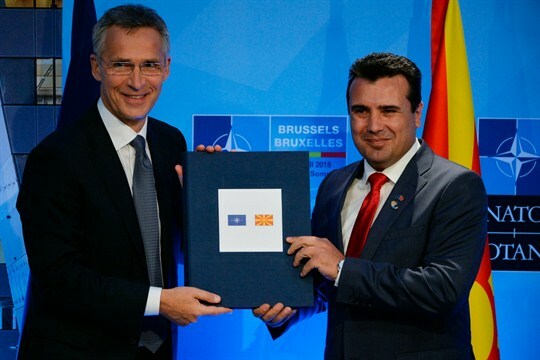 Macedonia Got the Green Light to Join NATO. Why Is It Still Worried About Russia? NATO Secretary-General Jens Stoltenberg, left, and Macedonian Prime Minister Zoran Zaev at the NATO summit, Brussels, July 12, 2018 (Photo by Alexey Vitvitsky for Sputnik via AP Images). Among the European countries that watched with great concern when President Donald Trump failed to confront Russian President Vladimir Putin in Helsinki on Monday, and when he lambasted NATO and the European Union earlier in his trip to the continent, was Macedonia. The Balkan nation of 2 million people has been trying for years to gain entrance into NATO, to the great irritation of Russia.